On a number of 18th-century maps of North Lambeth a property is identified as Dr Robert James’s Laboratory (1766 plan from the Gentleman’s Magazine). This doctor must surely have been the friend of Dr Johnson and inventor of James’s Powder, a ubiquitous medicine of doubtful effectiveness that was in use until the late 19th century. Oliver Goldsmith took it for his final illness and it was administered to the mad King George III. Dr James published many books, the most noted being his Medical Dictionary to which Johnson contributed. His property in Lambeth was unfortunately midway between Westminster Bridge and Blackfriars Bridge and vulnerable to the various roads that were proposed to link the two. He had to campaign to preserve his premises from these threats including addressing Parliament. 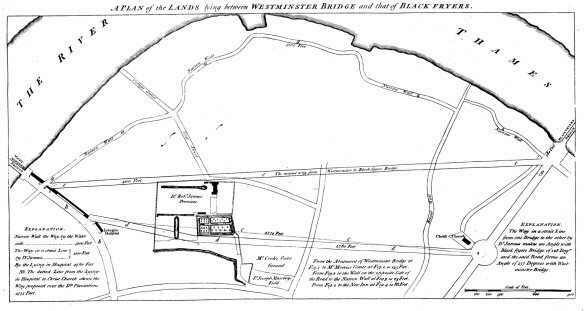 And he produced a pamphlet with his own alternative scheme in which he explains: “… About seven years ago, a Road was proposed by the Livery of London, or their Surveyor…. which is farther about by 680 feet (than the road he was proposing), an immense Way for a Porter carrying a Burden, or a Carriage; and would, besides, go thro’ Dr James’s Garden, utterly spoil it, and deprive the Doctor and his Family of the Advantages he hoped to reap from twenty Years Labour and a great Expence; amounting at least to Five Hundred Pounds a Year. In the short term his campaign was evidently successful but then his premises became the Belvedere Brewery and everything was swept away with the arrival of the railway. From the plans it looks like it was a substantial mansion with a long lake in the extensive grounds. This lake survived the mixed fortunes of the property and remains visible on plans well into the 19th century.